Using a computer program to create an average composite of all the faces in a group, someone has created the “average” face of women from forty-one different ethnic groups from around the world. Click here to see the larger version of the picture. It is a quite extraordinary work and really does show that many of the physical racial stereotypes exist for a reason – they’re true. Further, the image clearly shows that there are biological and genetic differences between the different racial groups; they are most certainly not “social constructs,” as the Marxists would have us believe. The differences between the Swiss and the Filipino or the Indian and the African-American faces are very evident. 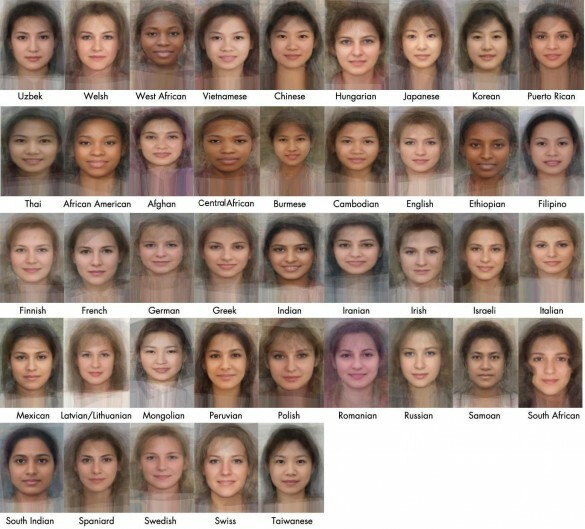 The similarities between faces of the same racial group can also be seen: English and German, Korean and Japanese, and Mexican and Peruvian. It would not be difficult at all to sort these faces into five or six groups (i.e. races) based on their similarities and differences.